The S4OPTIK 2500-CB Chair & Stand Units provide a unique solution to the space vs functionality challenge, all at an affordable price. A small 44.8” (113.7cm) footprint provides total functionality in instrument delivery and patient comfort by combining features of the S4OPTIK’s Examination Chairs and the spectacular engineering of S4OPTIK’s instrument arms. 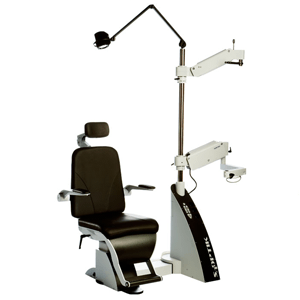 The S4OPTIK 2500 Fully Automatic Examination Chair is the perfect choice for today’s modern practice. Featuring a precision engineered motorized recline system extends from a seated to a supine position or any position in between. The 2500 Examination Chair also includes such features as convenient membrane buttons, a strong, yet silent Power Lift and Recline System, intelligent Rotation Lock, robust Foot Rest, functional Armrests, sensible Height Control locations, and an improved articulating Headrest design.